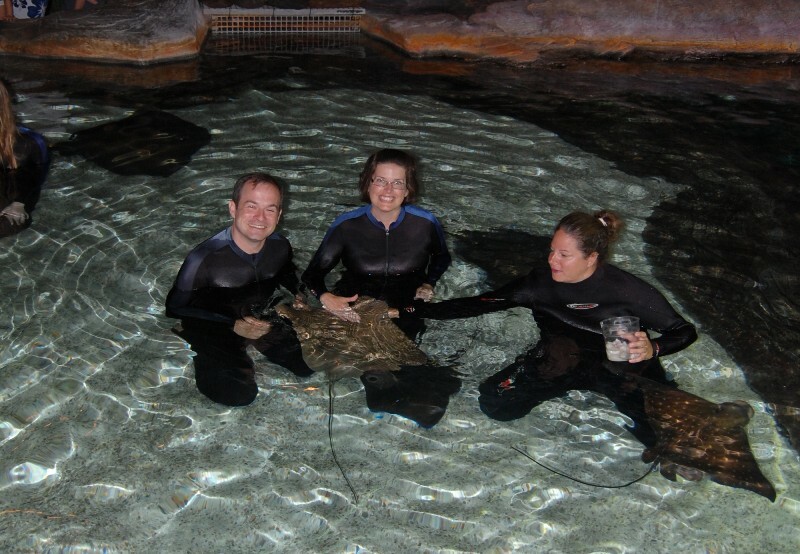 Swimming (well, kneeling) with stingrays! This past week I’ve been rather quiet about blogging and tweeting because I’ve been on vacation with the Wife and some of her family in Myrtle Beach, SC. We just returned yesterday and had a quite nice time, though like many vacations I feel perhaps even more exhausted than before we left! There were many nice aspects to the trip, but for me the highlight was a stop at Ripley’s Aquarium. The aquarium itself it relatively small, and most of the exhibits can be passed through within an hour, even at a leisurely pace. 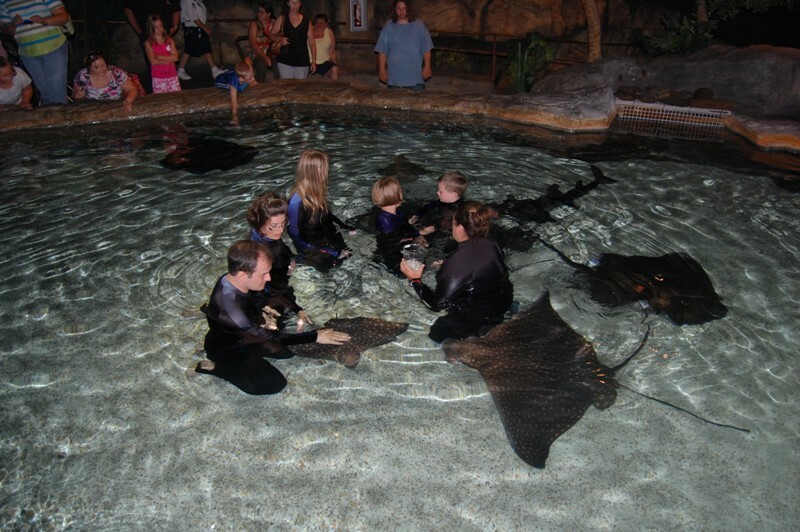 Nevertheless, they have a few really neat opportunities there, including an extra behind-the-scenes tour one can take that culminates with a hands-on encounter with their resident stingrays! 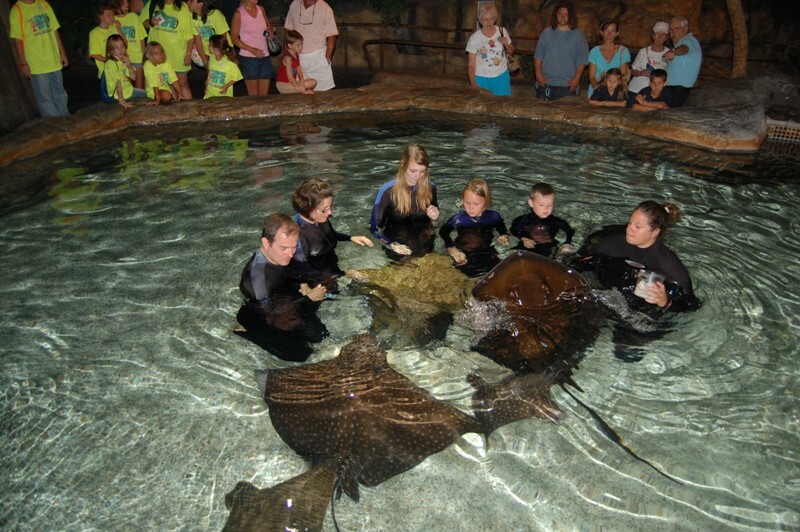 The Wife and I did the Swim With Stingrays Tour, and included with the event was a nice CD of pictures of our experience. First I should mention that the behind-the-scenes tour was very nice, and even provided one interesting optical insight. We were allowed to see the tropical fish exhibit from above, and it was pointed out that the glass of the exhibit strongly filters out blue light — the fish looked much more colorful and vibrant from above than from the “regular” view! We also stopped by the Giant Pacific Octopus exhibit, where it was pointed out that the octopus is a master escape artist and quite intelligent. Its only Achilles heel is astroturf, which it cannot grip with its tentacles. The octopus could also hear us talking behind its tank, and it became very active because it assumed it was feeding time! Once the behind the scenes was out of the way, we donned skinsuits and waded into the shallows of Ray Bay. To avoid inadvertently stepping on any of the rays, we shuffled to the center of the bay and kneeled down for the duration of the 45-minute encounter. 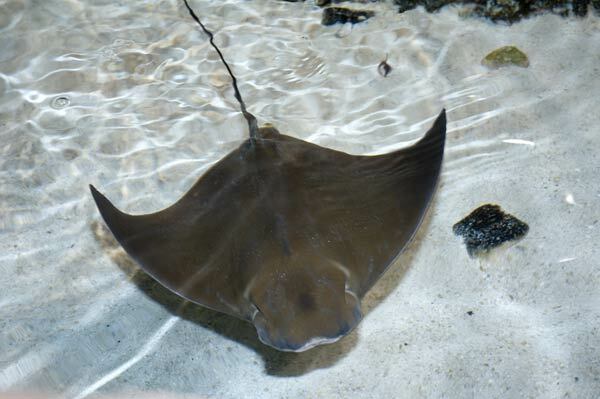 Rays, of the superorder Batoidea, are closely related to sharks (both are of the subclass Elasmobranchii) and share with the sharks the characteristic skeleton consisting of cartilage rather than bone. 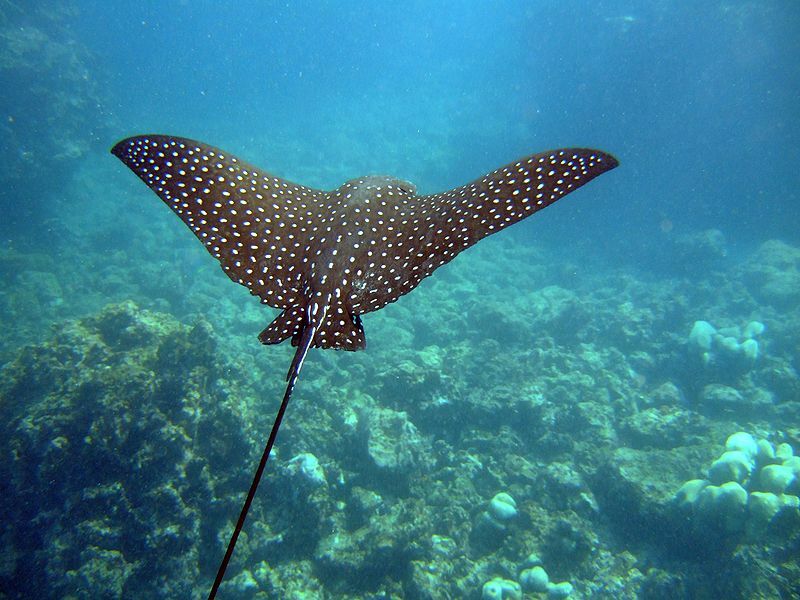 There are over 500 species of ray, and they come in many varies with many fascinating adaptations, including electric rays and sawfish. The rays we encountered at the aquarium all possess poisonous barbs in their tails for defense in the wild, though those barbs were removed from the animals on exhibit. It should be pretty clear which one I am in the picture, as there’s only one adult male human present! The keeper was feeding the rays part of their preferred diet of what appeared to be squid and shrimp, and the animals weren’t shy about coming right up to get it. 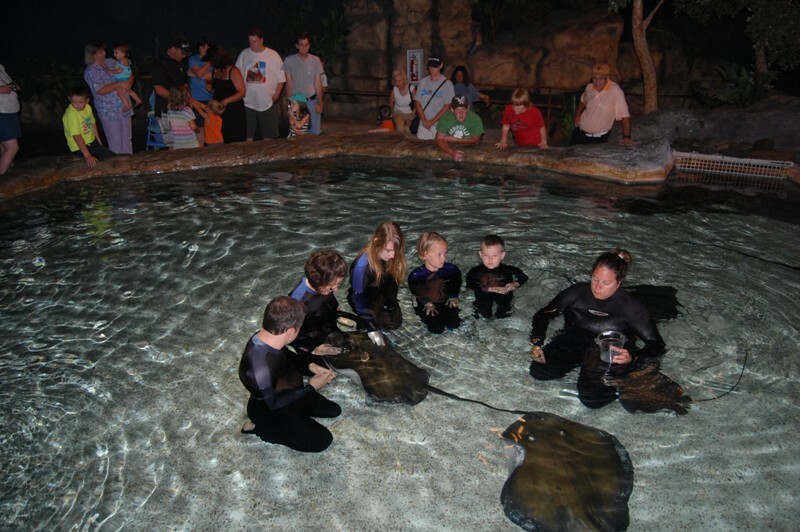 It is somewhat surprising that the rays actually seem to like being petted, but apparently in the wild they will rub against objects to scrape off parasites — petting is more or less an equivalent activity. Though the animals were de-barbed, we were told that the barbs eventually grow back. This made me relatively nervous, because the positioning of the keeper was such that I regularly had a Southern stingray tail smacking me in the face! 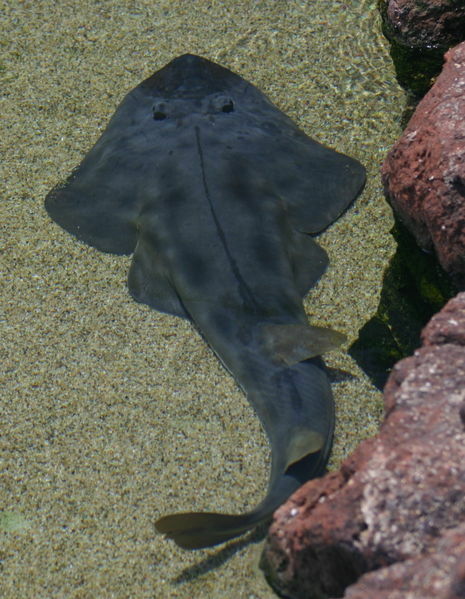 The guitarfish rather nicely illustrates the close connection between rays and sharks, as it looks somewhat like a ray’s “head” grafted onto a shark’s body! I couldn’t resist treating them as playful puppies. Apparently they can be quite devious at times, as well, as a story by the keeper illustrated. 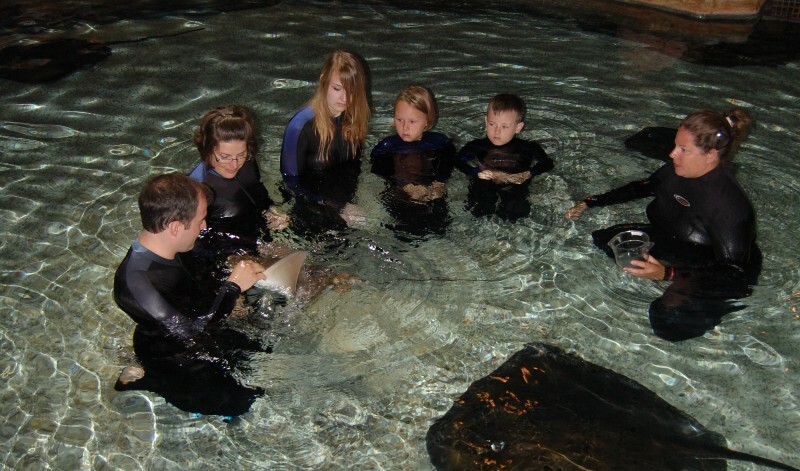 The cownose rays can distinguish between different divers on staff by smell, and can recognize new arrivals. 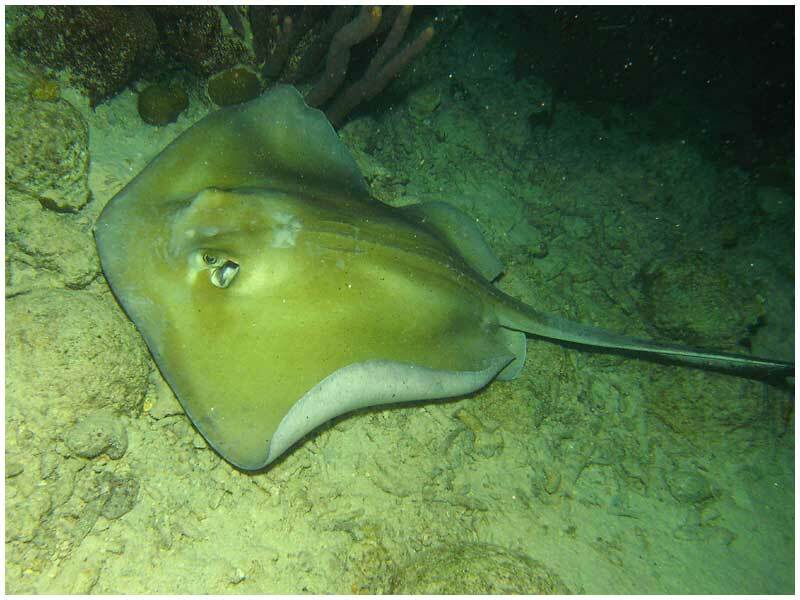 When a new diver gets in the water, a cownose ray will go and suction onto the diver’s mask, pulling it off: the diver panics, dropping the food dish, and the rays quickly gorge themselves on the inadvertent banquet! 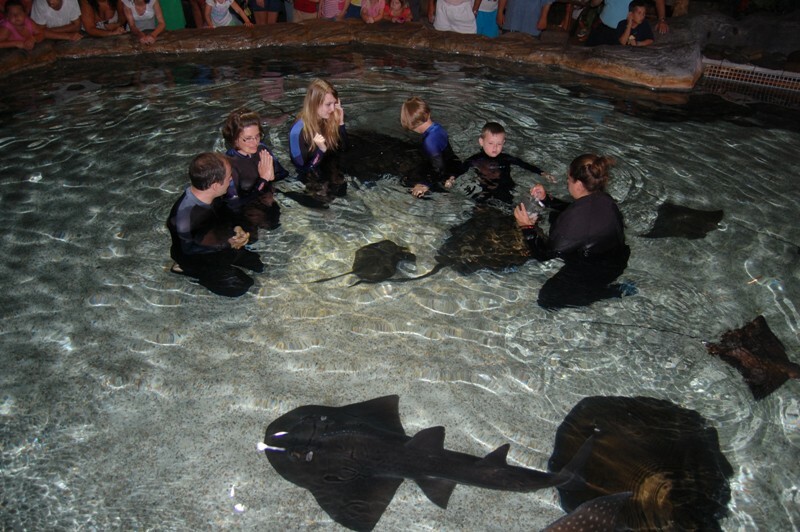 Though these animals are very human-friendly and playful in the aquarium, it should be stressed that this is the only place where one should try and get so close to them. In the wild they are unaccustomed to people and possess a poisonous stinger, and the stings have the potential to be fatal in rare cases such as Steve Irwin’s. I have always thought that rays were graceful and beautiful creatures; the visit to the aquarium also demonstrated to me that they are intelligent and friendly ones, as well.